Found the matching nightstand to my bureau and lingerie dresser! Lots of space for storage and looks great! Todays traditional has a more casual feel and this is mostly achieved through well, worn, rustic finishes. Rustic traditions is the heirloom quality Louis Philippe design with a burnished, rasped, rustic cherry finish. 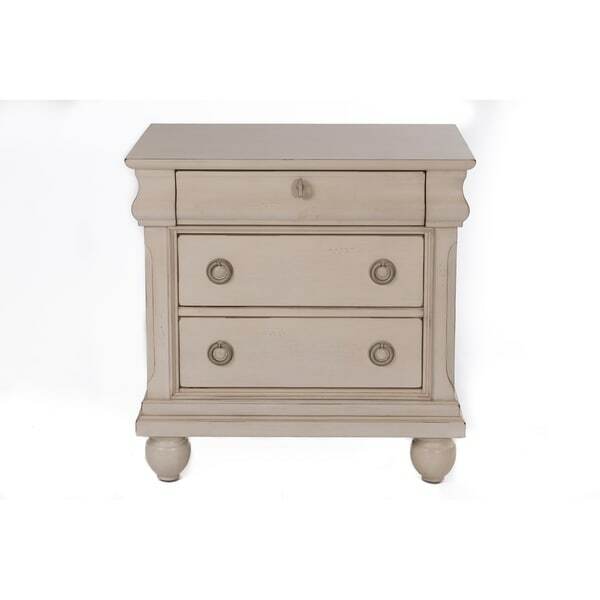 Cases feature chamfered pilasters, bun feet, drop ring and key hardware in an antique brass. The sleigh bed stands out with a rolled back panel headboard and the footboard features a rolled cap rail that scoops in for nice motion. Ships in one (1) box. Dimensions 17.0 In. X 28.0 In. X 28.0 In. I just received this today and love it! Can’t wait for the dresser to get here. To me they looked pink in the pictures which I liked but a lot of reviews said it is more cream which was ok with me. I think it looks very pale pink now that I have it and I am very happy with that. It is very sturdy the drawers are on sliders The top of the 3 drawers is lined nicely. My picture is without the feet. I just haven’t put them on yet. This is a heavy piece and color matches a chest I have to go with it. My night stand is antique white ... it doesnt appear pink??? I would recommend it. I give the item a 3 average rating because the distressed look is a little funky ... looks like staples removed in a cluster group and random throughout finish. 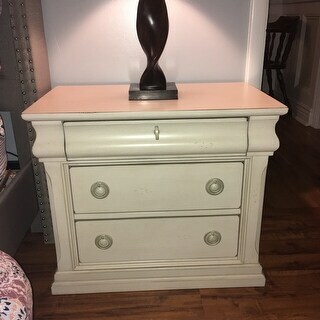 Quite odd however night stand goes in a guest room rarely use and the for the price I will keep it. Very well built and very sturdy, love the design! The night stands were packed very well and easy to assemble. Looking to purchase matching items. This was a little wider than I thought but love the size and look!